Travelling with coeliac disease can be extremely stressful, so our guide will arm you with tips and advice on how to eat gluten-free safely! Visiting a new country as a coeliac or gluten-intolerant traveller can be extremely stressful and frustrating, which is why forward planning and plenty of research are so important when considering your trip. Although coeliac disease is unheard of in some countries, eating gluten-free in South America is very manageable if you’re organised (and let’s face it, coeliacs are masters of organisation!). So we take a look at the naturally gluten-free foods, top restaurants, and tips to help you get by when visiting South America! The South American diet, in general, contains less gluten than the typical western diet, because grains like wheat and barley are not native to the continent. White rice and potatoes are the staple carbohydrates for most countries, so there are usually a number of options on the menu to choose from. The main difficulty is that coeliac/celiac disease is quite unheard of in South America compared to here in the UK, so you need to make sure you clearly explain what you can and can’t eat. If the language barrier proves to be a problem you can always stick to simple dishes like grilled meat or fish and salad. 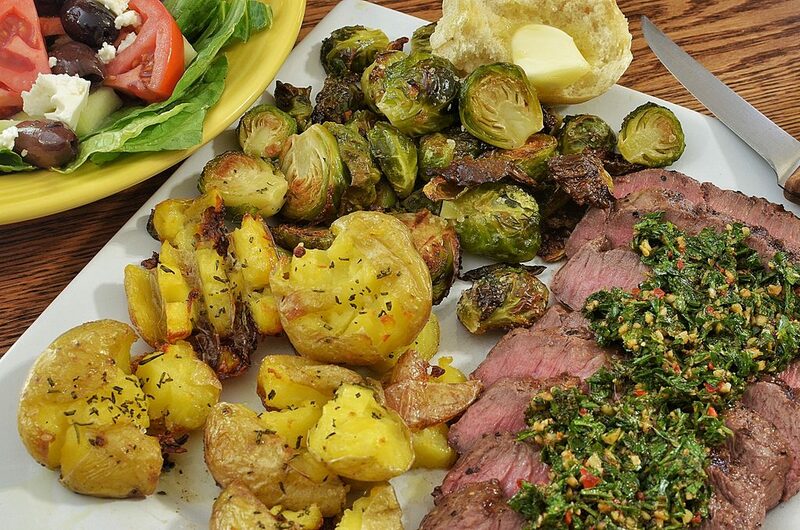 The fresh produce is delicious, so you won’t be missing out by eating these simpler dishes. South American food is a mix of cuisines from around the world. 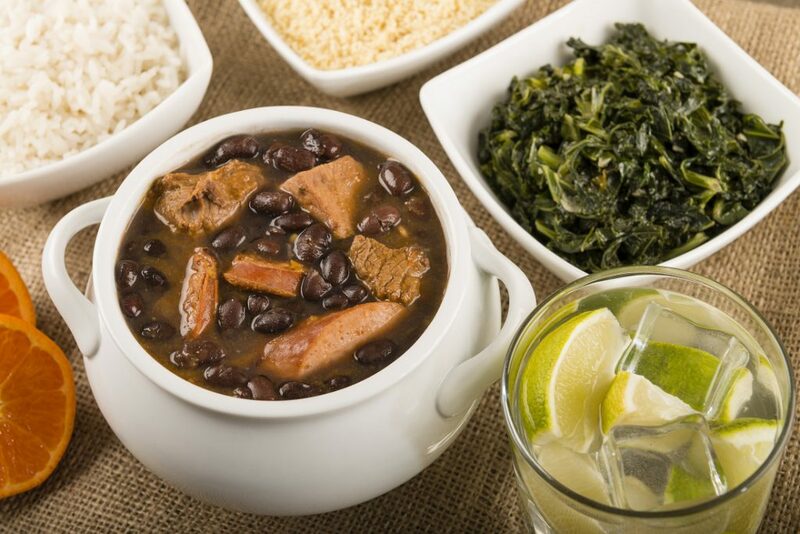 This feijoada is a typical Brazilian-African dish, and is naturally gluten-free! As one of the most popular countries in South America for tourists, English is widely spoken in Brazil, especially in Rio, so although many restaurants will be unfamiliar with the term ‘gluten-free’, you should be able to explain it to them easily enough. Brazilians are notoriously extremely friendly and helpful, and will go out of their way to ensure you get something nice to eat. Moreover, it is the law in Brazil that all packaged foods be labelled either “contén glúten” or “não contén gluten”, so finding gluten-free foods in supermarkets is actually fairly easy. These phrases can also be used when ordering in a restaurant, alongside your Portuguese gluten-free restaurant card! Pão de queijo will become your new favourite snack! 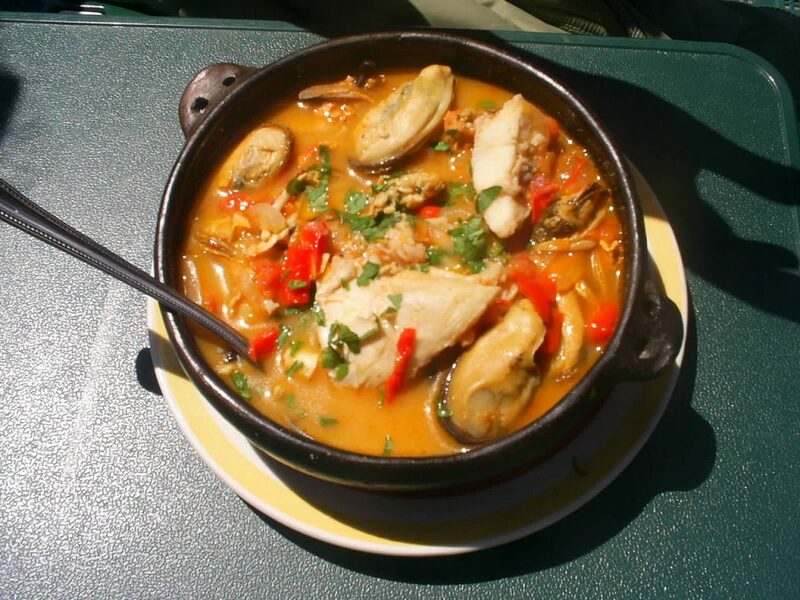 Moqueca (fish stew) is a northern Brazilian, African-influenced dish, which is naturally gluten-free and is cooked in a sauce of coconut milk, palm oil, parsley, garlic, tomato paste and peppers. In fact, these ingredients are the staple of many dishes in northern Brazil, which is particularly good for gluten-free travellers. You can also request vegetarian moqueca in most restaurants. Feijoada is another Brazilian-African fusion dish, which is a stew of beans, pork and beef, served with rice and salad. Tapioca or cassava flour is widely used for cooking in Brazil, often as a substitute for wheat or corn flour to thicken sauces as well. 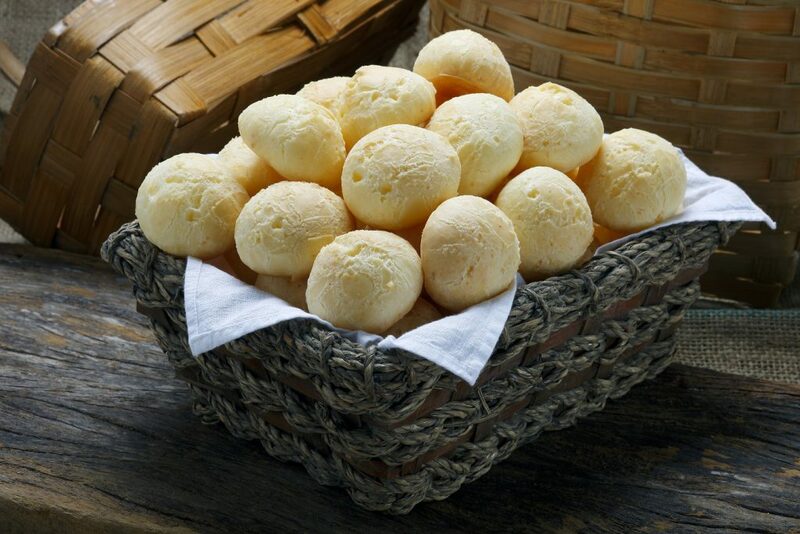 Pão de queijo is a delicious option for breakfast or just a snack, and is a staple of most hotel buffets. These small cheese balls are made from tapioca flour, so are naturally gluten-free, however always double check with waiting staff as we’ve also seen them made with wheat flour (although this is highly unusual). Tapioca crepes are another popular breakfast-option in Brazil. Sometimes there are flavoured with coconut, but they tend to be quite dry, so add loads of fruit and jam! Cassava/yuca fries are often served as a bar snack or side dish, and are delicious as well as being naturally gluten-free! 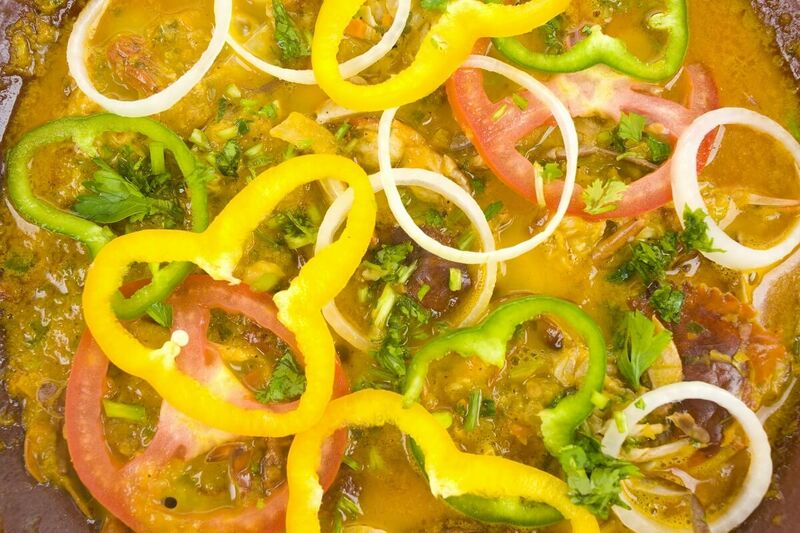 A bright and colourful moqueca! ‘Por kilo’ restaurants are buffets which charge you depending on the weight of your plate. They offer countless salads and fresh, gluten-free ingredients, however be mindful of cross-contamination with any buffet (celiacs might want to avoid them altogether). Being coeliac in Peru is much harder than Brazil, as the concept of ‘gluten-free’ is not widely understood and there are no laws which require foods to be labelled as gluten-free. The good news, however, is that Lima especially has some of the best restaurants in the world, with extremely talented chefs serving fresh, local ingredients. 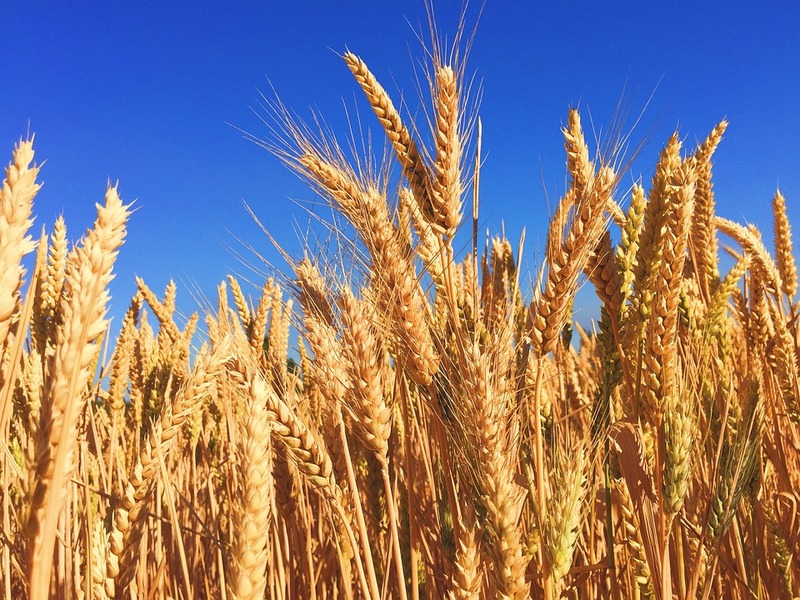 This means the chefs will know exactly what is used in each dish, and will be able to identify gluten-containing ingredients like trigo (wheat), cebada (barley), and centeno (rye). So make sure you’ve always got your Spanish gluten-free restaurant card with you! There are plenty of simple, fresh dishes to choose from in Peru, ceviche being one of the most popular. The biggest problem you’ll encounter in Lima is the use of soy sauce in chifa dishes, which is a fusion of Peruvian and Asian cooking. Unfortunately, this cuisine is part of what makes Lima the gastronomic capital of South America, but realistically it’s best avoided unless you’re confident the waiter/waitress truly understands your dietary requirements. Note that even Peru’s famous rotisserie chicken often contains soy sauce. Wheat flour often makes its way into Peruvian cooking as well, whether that’s because something has been deep fried in a batter, coated in flour before being barbecued, or a sauce has been thickened with flour. So don’t assume something’s necessarily gluten free, as mis-translated menus can also be misleading. Tamales is a great go-to option for coeliacs as it’s naturally gluten-free and can be made with a variety of different fillings. 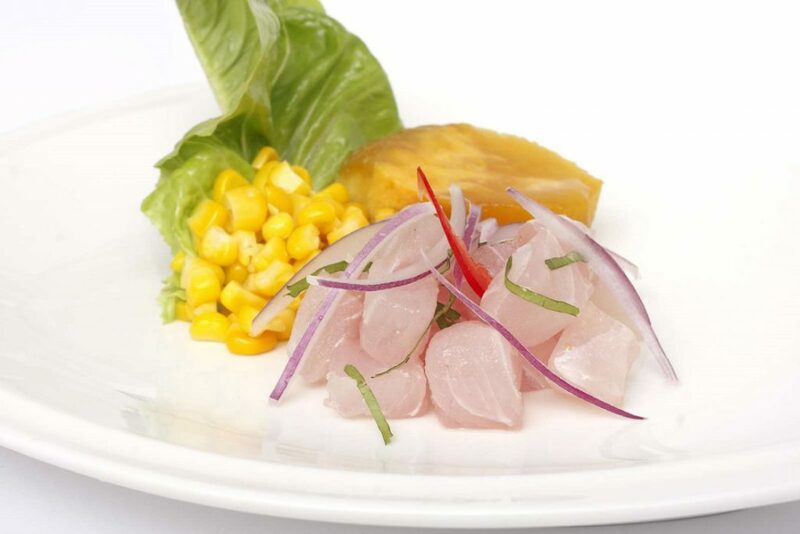 Ceviche is probably Peru’s most beloved dish, and because it only contains raw fish marinated in citrus juice and seasoned, it’s naturally gluten-free. Tamales is a breakfast dish or snack, and is made from corn flour, steamed in a banana leaf or corn husk. It is filled with anything from cheese or vegetables to seasoned meat. 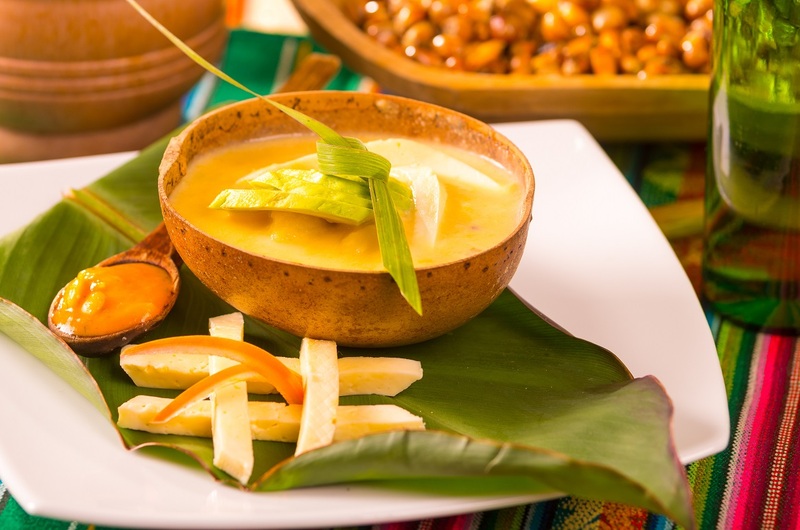 Huancaína is a popular Peruvian sauce made from evaporated milk and cheese, often served over potatoes. Although the sauce looks thick, it isn’t traditionally made with wheat flour. Carapulcra is another classic Peruvian dish, made from pork, dehydrated potatoes and peanuts. Again, the sauce is never traditionally thickened with wheat flour, but always ask if you have doubts. Rocoto Relleno is a classic vegetarian dish of stuffed firey peppers, often served with potato gratin. Quinoa is a Peruvian staple, and a safe grain for coeliacs to eat. Most people do the main tourist attractions in Peru with a tour operator, so make sure you let them know your dietary requirements in advance. As meals are often included in the tour price it is up to them to find you something suitable to eat and they’ll be more than happy to do so. The difficulty comes when you are eating out, as coeliac disease is uncommon in Argentina, so you’ll have to explain exactly what to can and can’t eat. The more upmarket restaurants will have more of an idea about the gluten-free diet, and as many traditional dishes are gluten-free naturally there should always be something suitable on the menu. Steak! It’s the epitome of Argentinean cuisine, and there’s no reason for it to contain gluten. It’s usually served with salad or cooked vegetables and some kind of potatoes; just be wary of roast or fried potatoes. Fainá is a type of flatbread made with chickpea flour (which is often served with a slice of pizza on top of it). However on its own it makes a great gluten-free snack, just make sure it doesn’t contain any wheat flour, which is sometimes added. 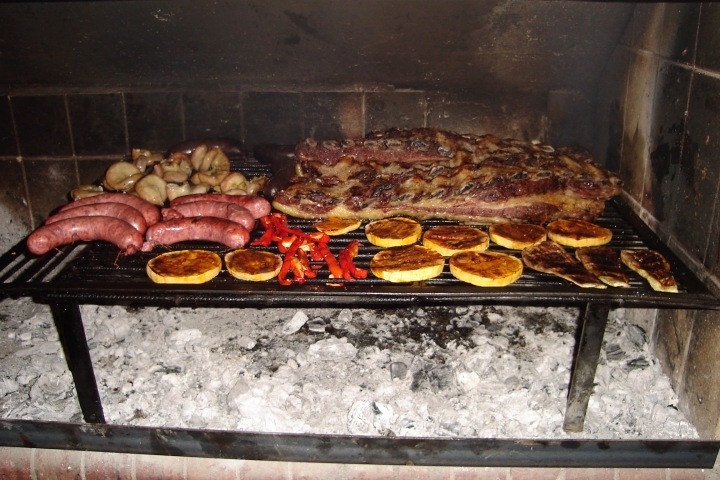 Asado meat joints are dotted around Buenos Aires, and the barbecued meat shouldn’t contain gluten. Provoleta is a delicious barbecued cheese dish, which is naturally gluten-free. Chimichurri is THE sauce of Argentina, and usually accompanies steak. It’s made from parsley, garlic, oregano, chilli, black pepper, and white or red wine vinegar. Ice-cream is a staple desert in Argentina, especially dulce de leche, so you won’t be missing out if it’s the only thing on the menu that’s gluten-free! 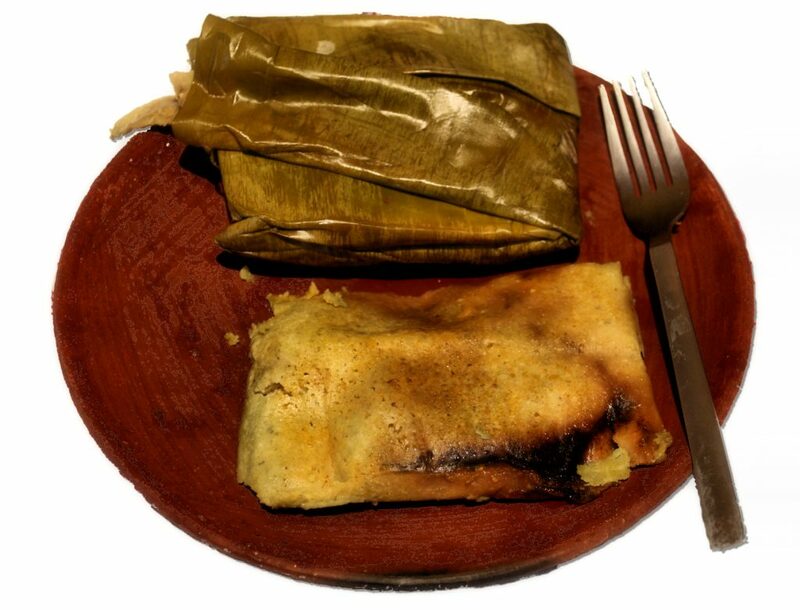 Humitas are a popular snack, very similar to the Peruvian tamales, made by combined corn flour with water and boiling in a husk or leaf. CeliGourmet – A chain of gluten-free bakeries in Buenos Aires! Sintaxis – A gluten-free restaurant with absolutely loads to choose from in Buenos Aires! The San Telmo Luxury Suites are a great accommodation option, and they do a gluten-free breakfast! Chile is a slightly trickier one, as bread is a staple food, served with every meal, and coeliac disease is not a well-known condition at all. The larger supermarkets do stock gluten-free food (which is mostly imported from Argentina), however most packaged snacks are not gluten free, including crisps, chocolate and yoghurts. Milcaos are a delicious and simple street food snack made by combining cooked mashed potatoes and raw grated potatoes, and frying in oil. The only risk here is cross-contamination, but as it’s street food you can see exactly how it’s made. 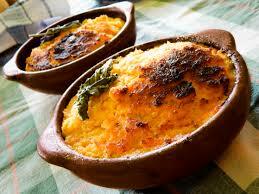 Pastel de Choclo is popular all over Chile. It’s similar to a cottage pie, filled with ground beef, chicken, olives and raisins, with a pureed corn crust or lid on top. 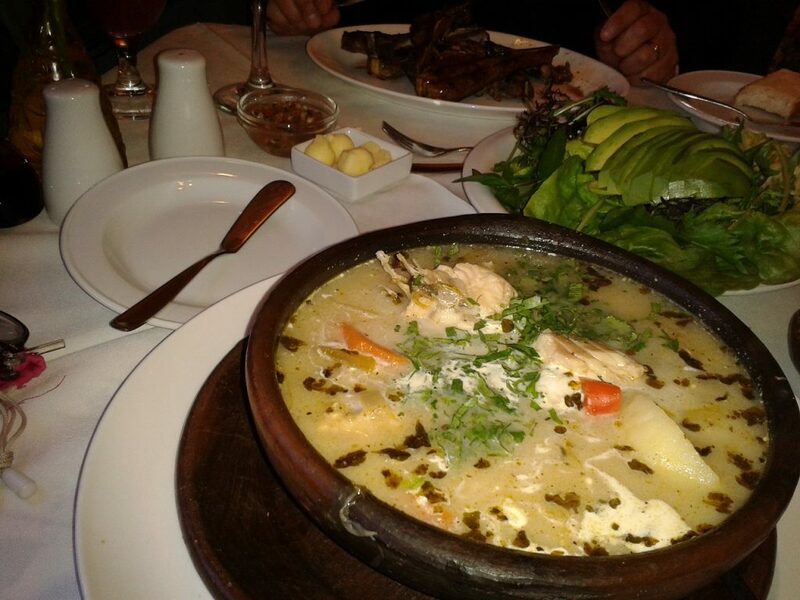 Caldillo de Congrio is a typical Chilean stew made with boiled eel broth and vegetables. The stock is traditionally homemade so shouldn’t contain wheat, but always double-check. Paila Marina is a seafood stew or soup, made from a shellfish stock, which is naturally gluten-free, although mostly served with bread. Caldillo de Congrio is a good choice for the more adventurous foodies! Bar Italia – This lovely restaurant in Santiago is 100% gluten-free, and serves delicious pastas and lasagnes. El Living – This English-run restaurant in Puerto Natales is vegetarian and does many gluten-free options. Chile are notorious for their tough airport customs, and the list of restricted food is long, so make sure you check what is and isn’t allowed before you travel. Of all the countries to eat gluten-free in South America, Bolivia is probably the biggest struggle, especially for coeliacs. Very few people speak English, and only a handful speak it well enough to understand ‘gluten-free’. Bolivian cooking naturally contains a lot of wheat flour, and similarly to Chile, supermarket snacks mostly contain gluten. Sonso is a street food snack made from yuca and cheese (or meat), which is cooked over a barbecue and is naturally gluten-free. Pique Macho is a typical Bolivian sharing dish of beef, hot dogs and boiled eggs, spiced and served over chips. It is naturally gluten-free, however the chips may be fried with battered foods. Palta Rellena is usually served as a starter, and is avocado stuffed with chicken and shrimp. 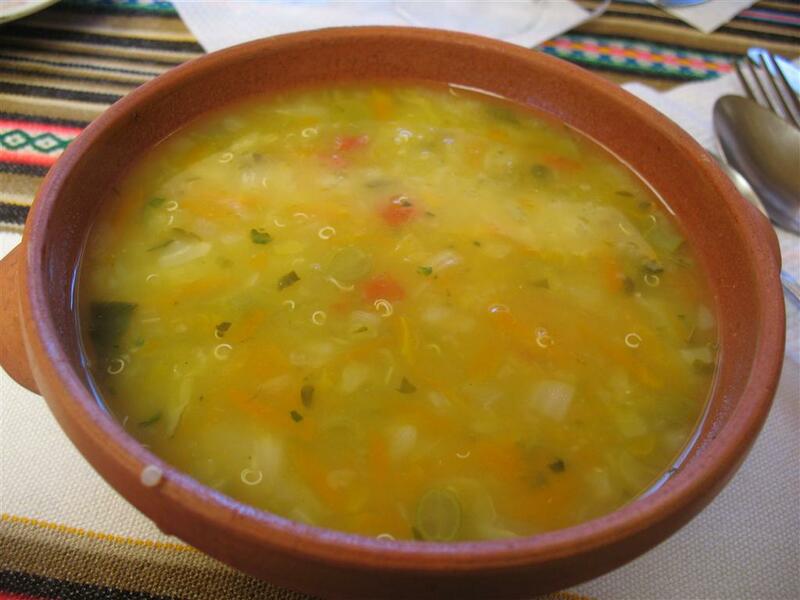 Quinoa soup is a good, filling option if you’re stuck for ideas in Bolivia. Traditional Bolivian restaurants will serve you better than international, specifically Italian, restaurants, as your food is much less likely to be cross-contaminated. The typical Ecuadorian diet doesn’t rely heavily on wheat-based foods, as yuca, plantain and rice are the main carbohydrates consumed. However gluten does still find its way into many restaurant dishes, and bread is served with nearly every meal. Traditional, local-looking restaurants will have many more gluten-free options on the menu than the tourist traps, which cater for the western palate (pasta and pizza, basically!). So if you stick to authentic dishes and use your Spanish gluten-free restaurant card you should be safe. Pan de Yuca are little cheesy bread rolls made from tapioca starch, very similar to the Brazilian pão de queijo, and make a great gluten-free breakfast dish. Chifle is a type of dried plantain, salted to taste, and it makes a good, safe snack, as there is nothing added to it. Encebollado is often regarded as the national dish of Ecuador. It’s a fish soup with boiled cassava and red onions in, sometimes served with chifle. Locro is a hearty stew of corns, potatoes and beans, which is native to the Andes region. One food to be particularly wary of is barbecued or grilled meats, which are often marinated before cooking, sometimes in beer. 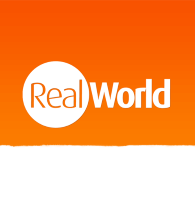 The internet has a huge range of blogs and sites dedicated to gluten-free travel which are a great starting point, but don’t be afraid to ask your travel agent, tour operator, or local tour-guide for advice as well, because they are the experts and will have up-to-date restaurant information. Why not take a look at our guide to being a Vegetarian in South America? Previous post What to pack for Brazil: 25 things you’ll wish you’d remembered! Please, we aware that the huancaína sauce in peruvian cuisine is not gluten free. It is made with crackers or cookies, alongside milk, cheese, onions and spices. Also, notice that anything containing “milk” probably uses “evaporated milk”, a kind of packaged milk which contains additives such as wheat maltodextrin. Also, most food street relies a lot on cheap packaged spices and marinades that contain soy sauce, wheat maltodextrine and are crosscontaminated with gluten. It’s a nightmare to be a celiac in Peru because almost nobody is and even doctors have no idea. I found one completely gluten free bakery! I came across the place as I accidentally took the wrong taxi and I saw the advertisement at some intersection. The owner is serious about Coeliac’s disease. He had certificates for all his products. I ate a delicious gluten free empanada here. The place is hard to find on Google. But look for “Panart Santiago” at “Av. Presidente Jose Batlle y Ordoñez 3545, Ñuñoa, Región Metropolitana” and you’ll find it.